In a coastal town with light crime, there swims a shark just off shore with a vengeful side and mesmerizing introduction theme. Admit it: If you could waltz into work each day with the Jaws theme introducing your arrival, you’d do it. Jaws is a munchy fellow, snacking on the locales who – let’s face facts – are invading his (her?) personal space. That harms the business of poor Amity Island business owners who rely on the superior influx of summer tourists for their income. People are running scared as the news slips though, terrified of the water, and it’s a mutual feeling. What creature features post-Jaws love to do is imitate. They hide their creature until the last possible moments, because hey, Spielberg did it. That’s missing the point. Jaws doesn’t work because of what you don’t see. It works because of the inevitable. Other films do it because their monster wasn’t in the budget. Funny thing this film is, playing right into the audience with a John Williams score that always signals the arrival of the title beast. Still, a fake out by a couple of kids with a shark fin is masterful in producing panic. Beach goers throw frisbees to their dogs, children splash the water, and teens scream as their boyfriends startle them. Because of an opening scene that found poor Chrissy slung through the water at night, the inevitable is due for those beach goers, and it’s not because of a paper fin. The viewer knows what the shark is capable of, and anyone of those minor extras is due. The territorial fish comes, the first glimpses fleeting after an establishment of character that packs the first hour. 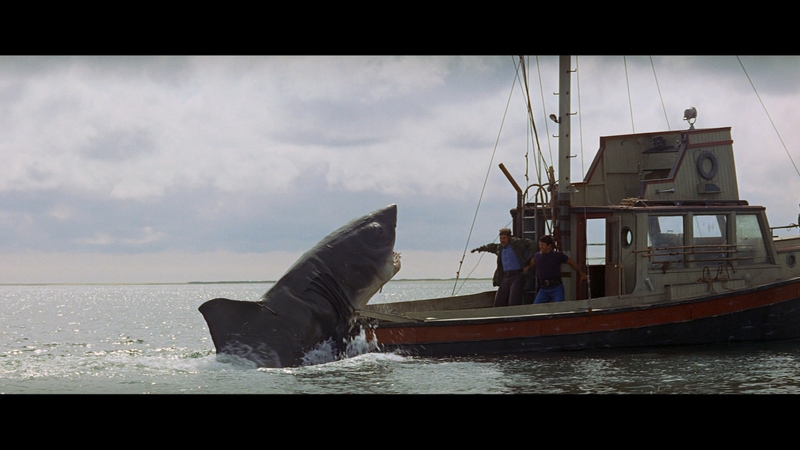 Jaws is brilliant in its pacing and smart in its development. When the film closes down, it’s a four way battle: three humans and one 20-foot… err, 25-footer. In the middle of nowhere and what would amount to a menial body count, Jaws takes off. 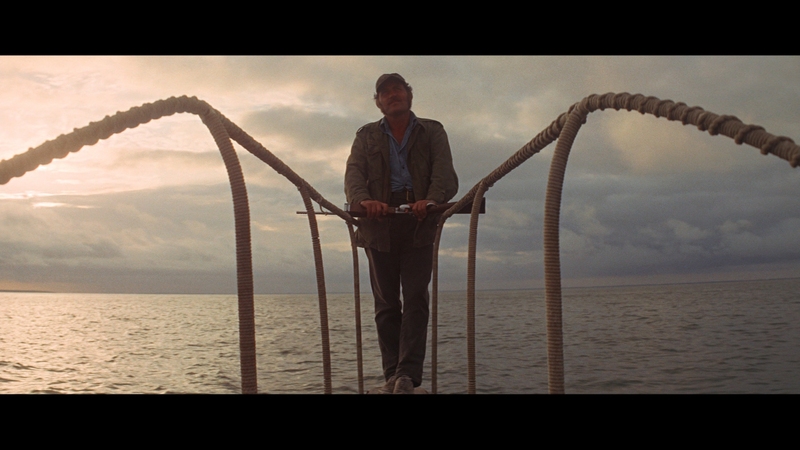 Quint (Robert Shaw) rattles on as a crazed fisherman out for revenge. He’s buried himself behind a wall of drunkenness, the source of disease as good a reason as you’ll find. There’s Hooper (Richard Dreyfuss), the young upstart biologist with a tinge of excitement generated from a grand upbringing. Then, there’s Brody (Roy Schneider), terrified of the water, desperate to keep his kids safe, but stuck in a position that forces his hand as the sheriff. Each come from different backgrounds and social classes, but are forced into a bond over a couple of drinks. They’re not as inexperienced as they look, even if Brody’s toughest challenge prior was taking down enthusiastic karate school students. Jaws closes on a worst fear scenario. Brody is forced into a water-laden heroic struggle, Hooper faces his career choice head on, and Quint’s past strikes back as a most egregious case of sour luck. It’s a conclusion that is as satisfactory from a character standpoint as it is in seeing the shark receive its comeuppance for being, well, a shark. Promoted as being fully restored from the original camera negative, Universal almost redeems themselves for their past transgressions with Jaws, free from obnoxious DNR and heavy handed edge enhancement. Spielberg’s killer fish flick is an absolute joy to behold on this format. Textural qualities and remarkable sharpness hit from the opening frames, a boost significant enough in the opening 10-minutes to ditch DVD forever. Replacing murky images is a staunch grain structure this AVC encode typically resolves with ease. Spikes in the film stock can become messy, but in a way that makes the longtime format follower smile. Universal left it alone. Oddball shots that appear smoothed out or filtered are uncommon. Consider the scene where in Brody, Ellen, and Hooper sit down for dinner. Shots of Hoop are flooded with source artifacts, a shot of Ellen flattened out. That’s within one edit, and the suspect was potentially heavy source damage that needed repair. There’s no reason to selectively apply noise reduction when the following shot is awash in noise. Damage that does remain hardly leaves an impression, a mild speck or two the only cause for concern. With the effects done in camera, there are no pesky multi-pass shots to dampen the video’s spirit. Let it be known this is one of the most consistent catalog titles on the format, free of chemical fades, awkward blue screen work, or film stock anomalies. Jaws is a straight run towards near vintage perfection. Colorists have brought the film into a genuine modern era without breaking down the timing. Flesh tones veer warm under the sun, leaving the rest of the image alone. Brightly saturated swimwear is striking as opposed to a previously dim, faded appearance. Even the opening shot set fireside takes on a dazzling color density that sets a strong opening tone. Definite black crush lines the interior nighttime cabin of the Orca, Brody’s black shirt becoming part of the background. Source lighting is minimal at best, and it doesn’t appear to be wrongly boosted. Cloudy skylines are a perky white that doesn’t stray from the familiar look of past home video releases. Thankfully, almost every other element does, and it’s for the better. Fresh from the restoration room is this DTS-HD 7.1 mix that celebrates one of the most iconic scores, bringing it into a generation that floods the surrounds and bumps the low-end. Unforgettable two note themes romp the subwoofer, giving the shark a voice it never had (or could have for that matter, unless you’re talking Jaws: The Revenge). High pitches will spread around the soundfield to reach a feverish panic that adds to the sequences of fleeing Amity visitors. Most effects are kept front and center, along with a veneer of pleasing age in the dialogue. Attacks, such as the dock, don’t lose any of their energy minus surround effects. It’s quite the opposite when elements do sling around or pan, as if they’re out of place. The major beach assault is under surveillance by a helicopter that will wrap around the speakers as it passes. When a full retreat goes into effect, most of the splashes and screams are kept to the stereos at best. The mix doesn’t feel totally in sync. Out in the open water, waves will softly hit the Orca with a slight separation, and some sound effects carry a little more weight. Without question, Jaws himself has never rammed the boat this hard at 1:34:45, splintering wood and LFE activity selling the hunger. After years of pestering Universal, the best documentary about the making of Jaws has an official release on the Blu-ray. The Shark is Still Working is feature length at 100-minutes, covering locations, effects, and the actors without skipping a detail. It’s been around for years, but if you haven’t caught it before now, this is the quintessential look at the film. Ported from the Laserdisc is another great making-of, sans title beyond “making of.” Given the age, the cast roster hadn’t suffered any deaths beyond Robert Shaw. This one is lengthy too, just over two hours, and dry by today’s standards. It’s a lot of talking heads, but the information is superb. Deleted scenes and outtakes are certainly not restored, ported from the DVD. Jaws: The Restoration is actually available on YouTube if you’re curious, but the compression and clarity of Blu-ray makes the comparison more striking. From the Set is a British piece that tracked the on-set activity. The archives section houses posters, marketing features, and photos. A few trailers are included too, while the disc offers D-Box and BD-Live services too.